How To: 1. 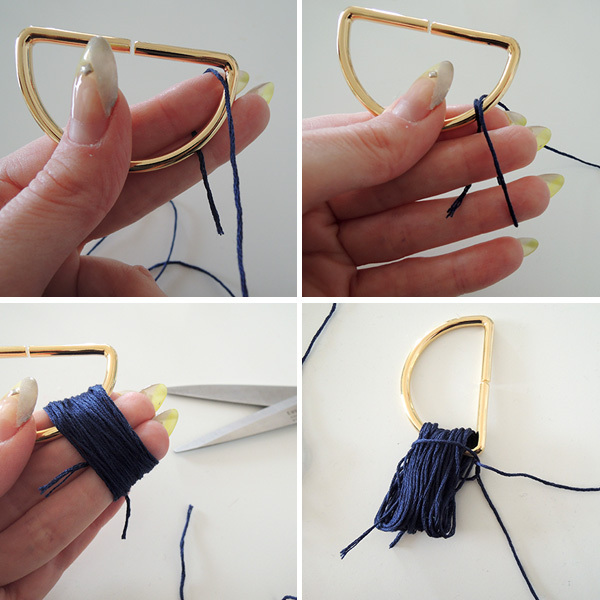 Start wrapping the embroidery thread around the bottom of the D-ring, using 2 fingers to create the right length. Wrap around many times until you get a thick bundle. 2. Slide your fingers out from the bundle. 3. Snip a short piece of thread and tie around the bundle, close to the D-ring. 4. Wrap both ends of the thread multiple times around where you tied, and tie the ends together with a double knot. Leave the ends loose for now. 5. 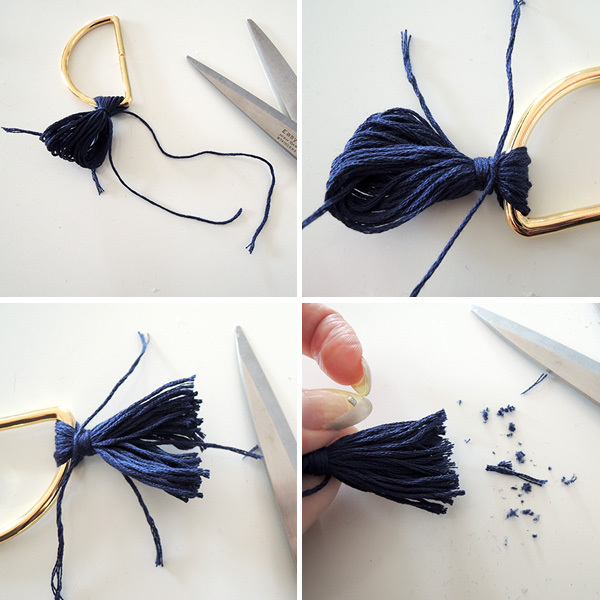 Use scissors to trim the bottom of the tassel flat. 6. 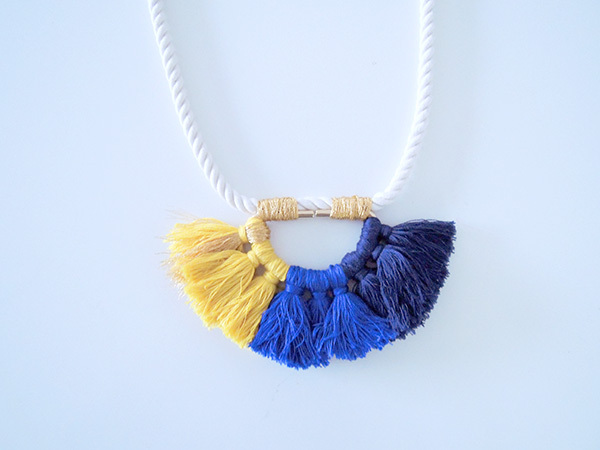 Fluff out the threads in the bottom of the tassel. 7. 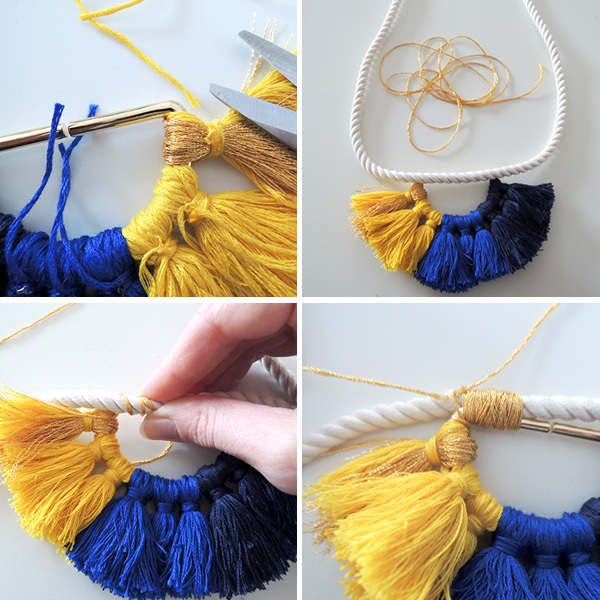 Repeat Steps 1-6 for 2 more tassels in your first color. 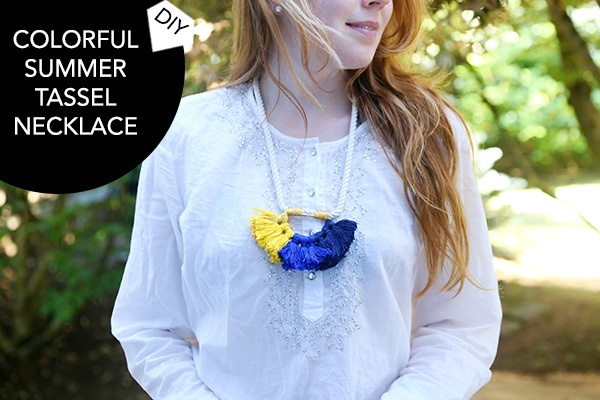 Repeat for 3 tassels in your second color. 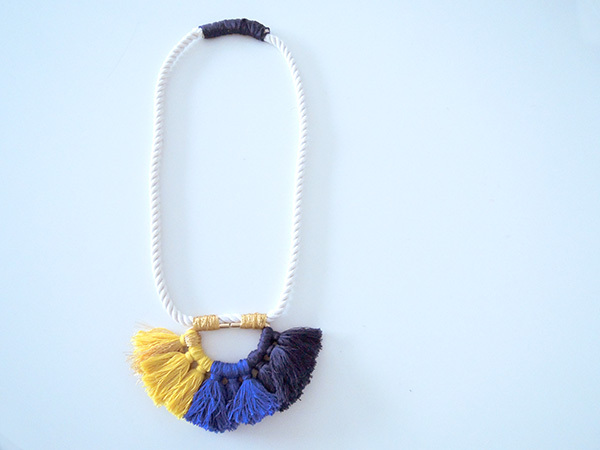 Repeat for 3 tassels in your third color. For the third tassel in that color, I made it using half metallic threads (since the metallic thread frays easily but isn’t as “fluffy” as the regular embroidery thread). 8. Use a dab of glue on each double knot you made in Step 4. 9. Snip off the ends of the threads close to those knots once dry. 10. 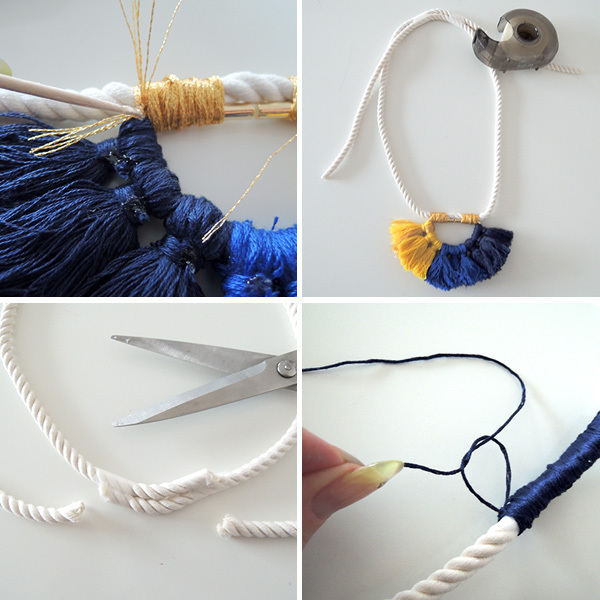 Place the D-ring with the tassels in the center of your rope piece. 11. Use the metallic thread to wrap around each side of the straight part of the D-ring, many times, to secure the ring to the rope. 12. Finish each wrap by double-knotting the thread at the back. Dab with glue, and snip off the ends. 13. 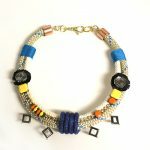 Try on the necklace and decide how long you want it. Use a piece of tape wrapped around the rope pieces to secure it to the length you like. 14. Cut off the excess rope. 15. 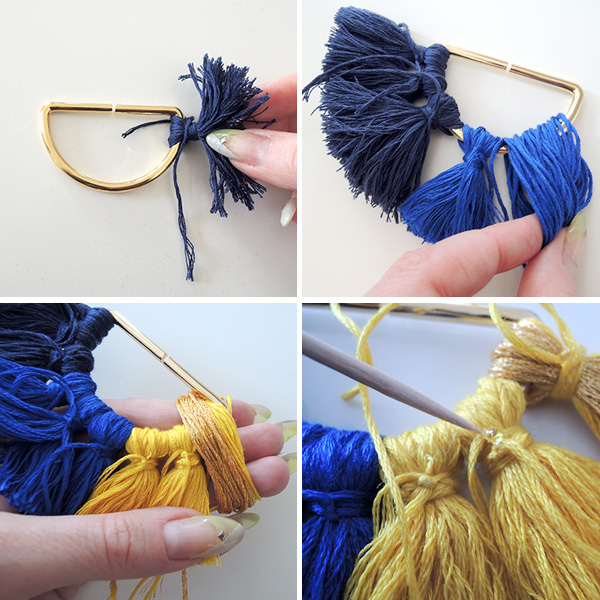 Use a contrasting thread color to wrap around the rope ends and completely conceal them. 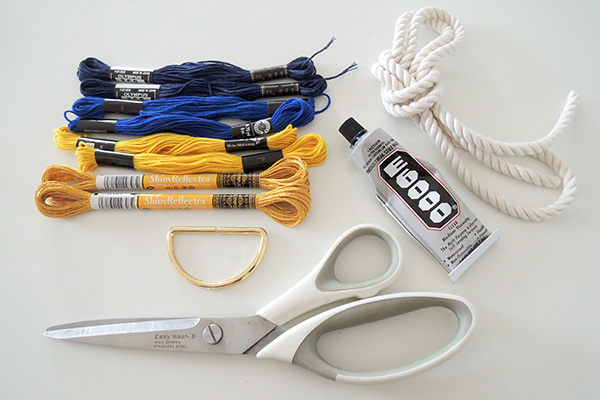 End using a double knot, dab on glue, and cut the threads. You’re done! 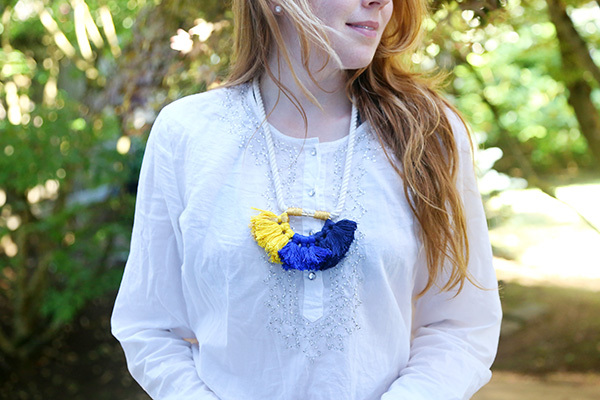 A bright, bold accessory for breezy tops and easy dresses this season is only a couple wraps and snips away. 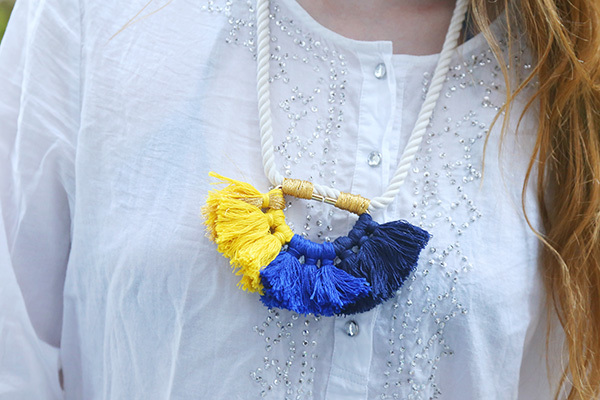 You can you any combination of fun colors, and totally switch up the look of the piece by adding pompons, charms, or other accoutrements to make it all your own! 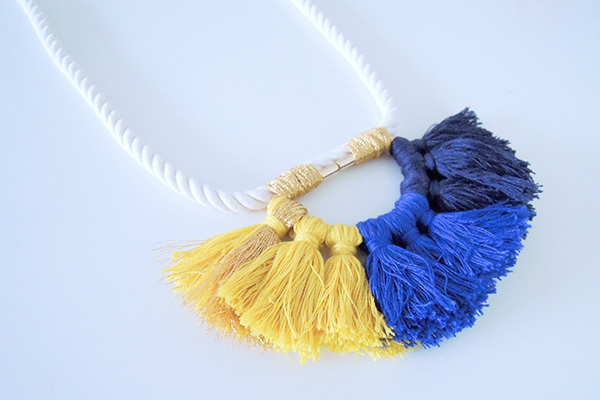 How will YOU wear your Colorful Tassel Necklace? Thank you, Linnae! 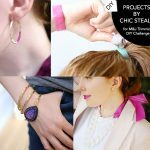 Definitely try it out with your favorite colors! Dang, girl, those nails!! I don’t usually like the stiletto nail look, but yours are hot! Great job. The D ring is so smart.